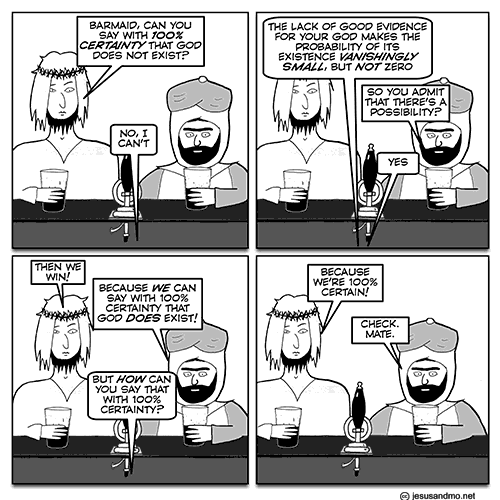 Today’s Jesus and Mo strip, called “mate”, came with a note that the author is “Fairly certain this is a new one.” Well, the author can’t be blamed given that in nine days the strip will celebrate its 13th birthday—that’s a lot of strips (and a lot of outraged religionists). You can become a patron through Patreon for as little as $1 a month; the link for that is here. “Mate” uses a rhetorical trick to prove God’s existence, something that may have been cribbed by Alvin Plantinga, who is to theology what Linda Sarsour is to progressive feminism. This entry was written by whyevolutionistrue and posted on November 14, 2018 at 10:15 am and filed under Jesus and Mo, Uncategorized. Bookmark the permalink. Follow any comments here with the RSS feed for this post. Both comments and trackbacks are currently closed. That comic would have been fun to me a couple of months ago, before I concluded the aggregated data now says the universe is 100 % mechanistic and religion works exactly like astrology shams. (With a perfect observed analogy between horoscopes and intercessory prayers/confessions, say.) I am sorry to say that to me it feels like “well, meh”, who doesn’t need a laugh? Coincidentally, today I twigged that the Dark Energy Survey released its cosmology observations from 3 first years of deep distance survey data onto arxiv nearly a week ago. Not unexpectedly it agrees with Planck’s aggregated LCDM data, dark energy needed and same expansion rate. Having 100% certainty means one won’t change their mind regardless of evidence. I don’t think that’s what you’ll do, or should do. Depends on whether or not you use non-Archimedean probability or not. A perfect strip exemplifying the futility of arguing with fatheists…or Trumpists for that matter. Indeed. The tRUMPglodytes are 100% certain that Wilbur Ross is a good fit, for one example of way the hell too many👿. Personally, I think consciousness is essentially epiphenomenal and, in particular, cannot see how the content of mental states could possibly affect events in the physical domain. But I would be cautious in disdaining, without evidence, the aperçus of the immaterial that are experienced by majorities of others. All software is epiphenomenal in that sense. But you may find it hard to explain what the physical states are doing without reference to their semantics, or the layers of representation from algorithm to source code down to machine states. The same software can run on different machines, and no purely physical description of the machines’ activity could describe or even predict their equivalence. As for consciousness, whenever I say something and realize I’ve said a pun I am reminded that the ability to see and hear myself is a critical component of my cognitive activity. Believing anything with 100% certainty is questionable. But, when 100% certainty without any evidence is absurd. Dawkins famously used a 7 point scale where 1 is a true believer and 7 is as certain there is no God. “…atheism arises from a lack of evidence and evidence can always change a thinking person’s mind.” So, being a 7 is not a viable position. Dawkins called himself a 6.9. That really doesn’t cut it anymore in the modern world. A true atheist would be 110% certain. Or 120%. Or maybe 200% or 10,000%. It’s just gotta be yuuge. …..but which one is 100% real mate! Saying that there’s a possibility that god exists is a philosophical use of the word, not one that can be used in a mathematical context. Not that that’s ever bothered Alvin Plantinga. I have had this conversation with a few religious friends, and none of them said they are certain. They asked me how certain I was that there is no God, and I told them I could not put a confidence interval on the existence of “God” in general, because I have to accept that “God” could take a form unimaginable to me. After all, I am just a smart cousin to a chimpanzee. I told them I was 99+% certain the biblical God does not exist. My religious friends were over 90% certain there was some form of personal God, but they were less certain as to exactly what that form would be. They worship the biblical God because that is the form most familiar to them, but most of them doubt specifics in the bible. These people are all well educated so I doubt they are representative. I’d like to see a poll on this. What the believers don’t admit is that there is strong evidence that God does not exist. When they deal with the weight of negative evidence I’ll be more willing to listen to their arguments about the lack of positive evidence and what it does or does not imply. I’m waiting for the barmaid to ask them whether the God they are 100% certain of is a trinity or a unity.